Whether it's a last-minute pre- or post-party, or a festive get-together that you actually planned because your New Year's resolution was to "start planning things," throwing a good shindig takes some ingenuity. 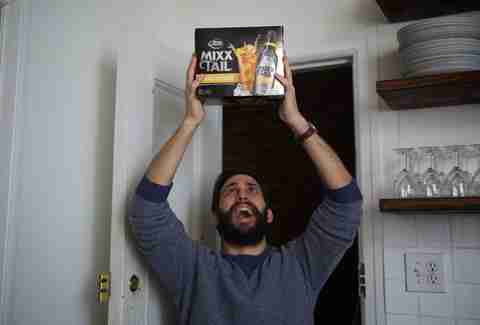 Our rundown of clutch hacks will ensure that your bash makes a splash. Just don't mess up the guest list and tunes. No giant ice cubes to drop in your glass? No problem! 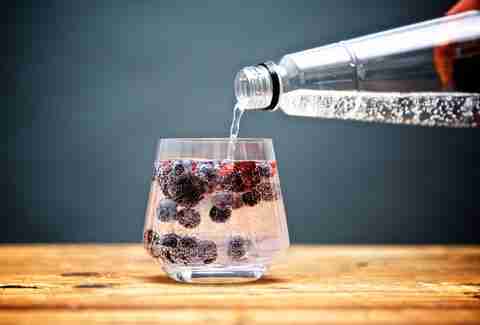 Avoid diluting your drink by freezing grapes/berries. Or chill a bottle or can by storing it next to a frozen water balloon, or wrapping it in a wet towel before putting it in the freezer. Also, be chill. 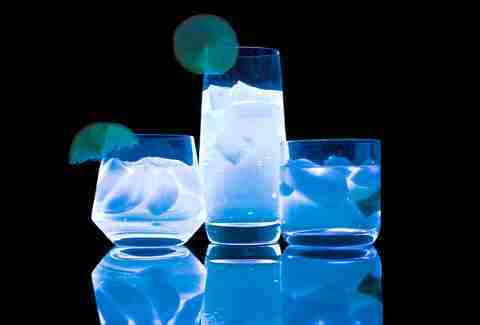 Tonic water + black light = drinks aglow in their cups. Just remember to check your shirt/kitchen/etc. for stains first. Something even cooler (decoration only): Break open highlighters, then put the tip (just the tip!) inside a bowl of water. Let the tips soak and then pour the highlighter-mixed water into whatever containers you want to light up. A solid sound system is a must. 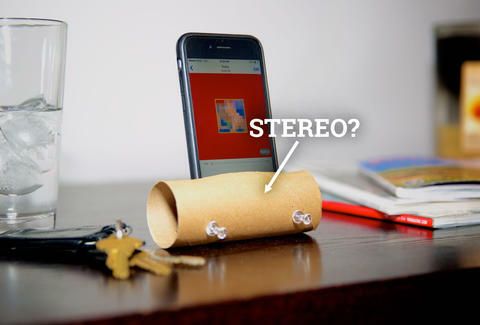 If you don't have one or the one you have is on the fritz, cut a notch in a toilet paper roll and slide your phone inside it. It’ll serve to both amplify the sound and make you look like some kind of party wizard. 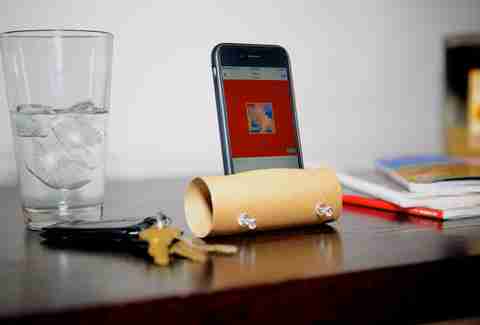 Don't have a toilet paper roll? Then we hope you have a bidet. Regardless, you can drop your phone into glass or bowl for a similar effect. Say you've got this super-good scotch that you had no intention of breaking out at this party because it's too expensive and not exactly festive either. Say some dude is like, "Hey, can I try that Glenmaracasmore 40-year with a splash of water?" and you don't want to say no because that would be awkward. 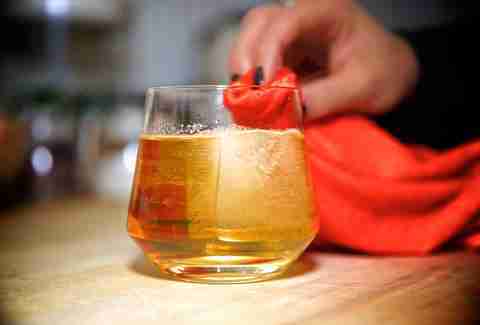 Do this: polish the rim of their glass with a liquor-soaked towel. He’ll think you are a classy host for polishing his glassware, but really what's happening is you're making his drink smell and taste a LOT stronger than the weak one you actually made him. Counteract the smelly effects of too many possibly sweaty people, too many spilled drinks, and that one jerk who smoked in your bathroom by making your own potpourri. 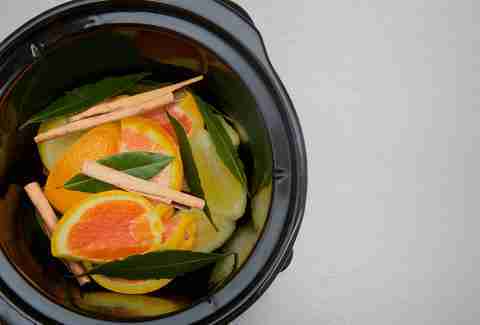 Just throw some fruit (lemons, apples, oranges will all work) in a slow cooker, and then add bay leaves, cloves and cinnamon. Unlike store-bought stuff, this won't make your apartment smell like a doctor's office. Say you can’t find a corkscrew. Some people will tell you to push the cork into the wine. Others will tell you to beat the back of the bottle with the heel of your shoe, which makes you look faintly ridiculous. 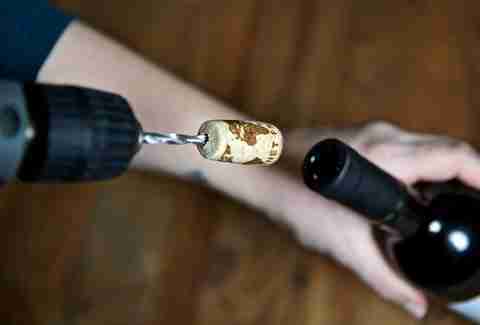 Instead, use a power drill to pop out a cork. NOTE: If you have neither a corkscrew nor a power drill, the shoe thing does work, if you don't mind looking a little desperate/a little like Nikita Khruschev. 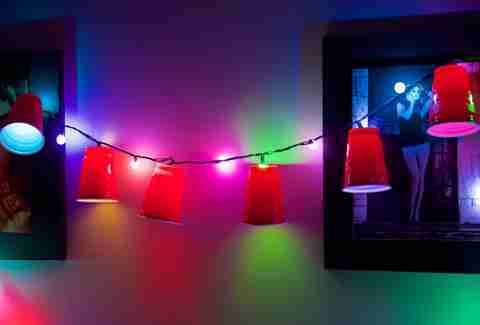 Dig those X-mas lights out, cut a hole in the bottom of some Solos and place them over the bulbs like lampshades. Presto! You've got a suitably festive atmosphere and an occasion to use those damn lights more than once a year. Should your party move outside, here's a tip we got from a gal known for throwing arresting house parties, Martha Stewart. Just mix white vinegar with water in a spray bottle and shake it up. Sure, you could battle the bugs with a mad stream of regular repellent, but bug spray smells bad, is toxic, and a lot of people are allergic to its active ingredient, DEET. You could say they experience the agony of the DEET. Or not. Start buttering up your neighbors weeks in advance. A nice way to do that? 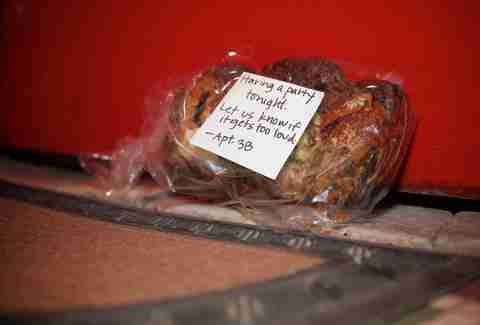 Give them something neighborly, like a babka cake! Or a phone number they can call you at before they call the boys in blue.